Misfit has a new fitness tracker, the Flare, to add to its growing collection and it's adhering to the latest "less is the new more" slogan. The Flare is available now for $59.99, and manages to pack in activity tracking essentials such as step counting, distance travelled, calories burned and sleep. It doesn't bring all the Misfit features you might be used to, though, so it's worth digging into what you get and what you're missing before you make your choice. 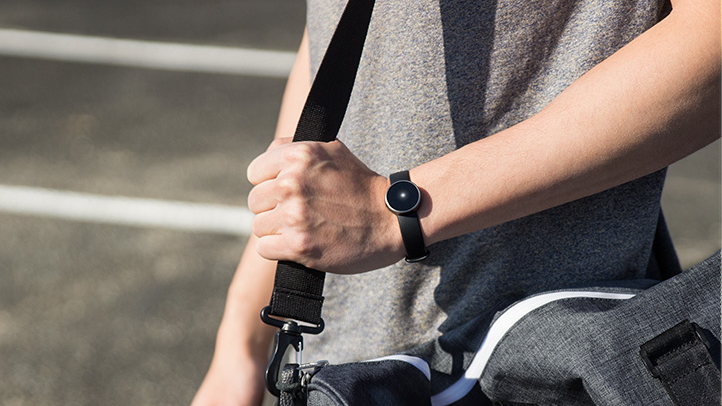 Here's what you need to know about the Misfit Flare activity tracker. Seemingly influenced - or vice versa - by all the Fossil Group fitness tracking wearables we've seen choose this form factor, the Misfit Flare is the most minimalist version of a small circular module. Misfits says the case is aluminium with a crystal face and it's fully molded onto the band which is TPU plastic. This is the first time you won't be able to pop it off/out so no chance of it falling out and going AWOL, a problem we've encountered with previous trackers. The Flare is only available as one black sport model on the Misfit store right now, but with Misfit's commitment to customisation, like we've already seen on the Ray and Shine 2, we expect to see plenty of colour options and extra bands available soon. As for what it can do, there's a 3-axis accelerometer and magnetometer inside. It does the basics, tracking steps taken, distance and estimated calories burned, but there's no altimeter to monitor elevation. If you're hoping to keep tabs on specific exercises rather than just day-to-day wandering, the Flare will act as your wrist companion for running, walking and tennis, but this will still need to be tagged through the companion app since the device does not offer automatic recognition of activities. The fact that the Flare only weighs 8.5 grams, would appear to make tracking sleep with it a cinch. There's no need to press anything to activate this, you'll simply be fed data on light and restful sleep, as well as duration, once you're up and about. For swimmers, while you'll be able to keep tabs on laps and distance in 25 and 50 metre pools, this is only available after a $10 in-app upgrade. Misfit says the Flare is "swimproof" in water up to 50m. As for the non-tracking features, if you sign up for and download Misfit Link, you are also able to sync the device's smart button up to control the likes of selfies, music on your phone, presentation slides and even connected household devices as per previous Misfits. Of course, with this now becoming the cheapest tracker in Misfit's range, it's lighter on features. The big difference is that there is no notification support here, as found on the Misfit Shine 2 and Misfit Ray - this is pretty much solely focused on the activity tracking. And there's also no reminders, with the only indication of your progress being a single flashing white LED on the circular face. One light will indicate 25% of your goal, two will mark 50% and three is 75%. The new design also means that unlike previous wearables, this one won't be able to tell you the time at a glance, shame. What the Flare does carry over, though, is the usual Misfit battery exploits, which will see the non-chargeable device's coin battery last up to four months. Of course, in our experience with Misfits in general, the coin cells don't always last this long but it's a real bonus not having to charge up every night and they're simple enough to replace. We haven't had an official announcement from Misfit yet but the Flare is live now on the US Misfit online store to buy for $59.99. It isn't live on the UK online store yet. That price means it comes in cheaper than its Misfit Ray and the Misfit Shine 2 siblings but more expensive than the Misfit Flash/Flash Link. These are the cheapest, larger Misfits which seem to getting phased out officially but which you can still pick up on Amazon. Here's the bottom line: there's nothing necessarily new on the spec sheet to get excited about, but the Flare brings you Misfit basics at a budget rate. For someone looking to get on the wearable tech ladder with a stylish, fuss-free device, this could prove to be a manageable first step.